Krsna Slava - the celebration of the home Patron Saint-is the greatest characteristic of the national and religious life of the Serbian people. It is a beautiful and unique expression of the Orthodox faith that is deeply implanted in the Serbian Christian soul. Krsna Slava is an exclusively Serbian custom. It is the most solemn day of the year for all Serbs of the Orthodox faith and has played a role of vital importance in the history of the Serbian people. Krsna Slava is actually the celebration of the spiritual birthday of the Serbian people. Our forefathers accepted Christianity collectively by families and by tribes. In commemoration of their baptisms, each family or tribe began to celebrate in a special way to honor the saint on whose day they received the sacrament of Holy Baptism. The mother church blessed this practice and proclaimed Krsna Slava a Christian institution. According to the words of St. Paul (Phil. 1:2), every Christian family is a small church, and, just as churches are dedicated to one saint, who is celebrated as the protector of the church, so Serbian families place themselves under the protection of the saint on whose holiday they became Christians and to whom they refer to as their intercessor to God Almighty. To that protector of their homes, they pay special homage from generation to generation, from father to son, each and every year. Slava is a day not only of feasting, but also a day of spiritual revival through which the Serbian national soul is formed and crystallized. To these celebrations, customs, and traditions, our nation owes its existence, and, therefore, deserves to be appreciated and perpetuated by all grateful Serbian sons and daughters all over the world. The living example of the Patron Saint gives to the celebrant assurance, persistence, and the feeling of protection, support, and the encouragement to do good. For that reason, we hear among our people the ancient saying: "Ko Slavu slavi, tome i pomaze". In translation this means, 'Whoever celebrates the Slava, him the Slava helps'. Rightly so, for according to the teaching of the Church, the Church is the communion of all the Saints, in which Christ abides. There is strong evidence that the intercession of the Saints is effective. Accordingly, St. Paul advises us saying, "Give thanks to the Father, who has qualified us to share in the inheritance of the Saints in light" (Col. 1:12). The commemoration of Krsna Slava was to our ancestors one of the most important expressions of their Orthodox faith. So they always celebrated their Krsna Slava, regardless of how dangerous the situation. In our long suffering history, the state and freedom ceased to exist, but in our homes, the candle of our Patron Saint never was extinguished. The Serbian Krsna Slava links, as a golden string, our past and our present, our ancestors and their descendants. Serbian people should never ignore their Krsna Slava because through it the Orthodox faith was preserved and they were held together through the centuries. Krsna Slava should be kept not only as a sacred custom, but also to attest to the sacred truth that "Where the Serb is, Slava is also". 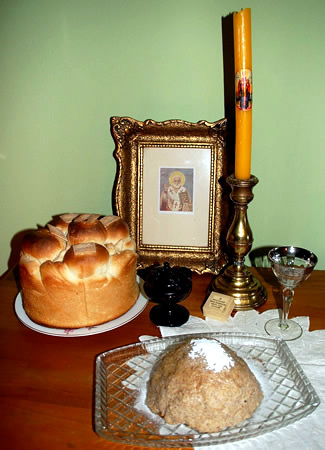 The celebration of Krsna Slava requires the Icon of the family Patron Saint and several items that symbolize Christ and the believer's faith in his death and resurrection: a lighted candle, Slavsko zhito, Slava's bread (Slavski kolach), and red wine. 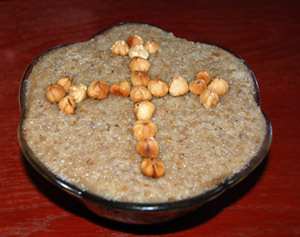 Slavsko zhito - boiled wheat (koljivo), represents the death and resurrection of Christ. Christ reminded us that except a grain of wheat die it cannot rise again, even as it was necessary that He die, be buried, and on the third day rise again so that we all can triumph over death. The Slavsko zhito is prepared as an offering to God for all of the blessings we have received from Him; it also is to honor the Patron Saint and to commemorate our ancestors who lived and died in the Orthodox faith. STEP 1 "Prepare the Yeast Into a measuring cup or small bowl, mix the yeast with a teaspoon of sugar and about a half cup of the "lukewarm" milk. Set aside. This activates the yeast. STEP 2 "Mix eggs and milk" Into a medium mixing bowl, beat the 3 egg yolks and then add the rest of the lukewarm milk. Mix well. Set aside. STEP 3 "Mix dry ingredients with butter" Into a large mixing bowl, add the sugar and salt to 8 cups of sifted flour. Add about a tablespoon of lemon zest and equal amount of lemon juice. ( More or less to taste.) Add the butter, mix with your hands (as for a pie crust) until the butter is well mixed with the flour and has a real fine texture. STEP 4 "Make the dough" Combine the beaten "egg & milk - mixture" and the "activated yeast" to the flour mixture. Beat the dough until it comes clean from the bowl. STEP 5 "Knead and Rise" (Twice) Form the dough into a ball and place into a large clean bowl and cover with a damp cloth. Set aside and let rise for about 2 hours. The dough will more than double in size. Once the dough rises, remove from the rising bowl and place on a lightly floured counter top or kneading board. Knead the dough. (For about five minutes or so.) Again form the dough into a ball and place in the bowl, covered with a damp cloth. Set aside and let it rise. This time, it takes about 1 hour. STEP 7 "Bake" In a preheated oven. Bake at 350 degrees for about 1 hour and 10 minutes. Variation: In addition to or in place of the Lemon zest and juice used in Step 3, you can substitute or add a teaspoon of Vanilla extract. 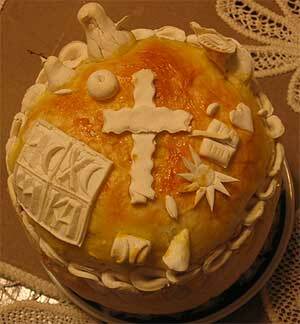 Slava's bread - Slava cake (Slavski Kolac), represents Jesus Christ as the Bread of Life. It is also symbolic of our thanks to God for being saved through Its Son. During Slava, the priest cuts a cross in the bread, which reminds us of Christ's death on the cross for the remission of our sins. The red wine, of course, represents Christ's precious blood, which was required to wash our sins away. Note that understanding the symbols of Slava helps us understand the meaning of the celebration. There is one symbol, the Slavsko zhito, that needs some special explanation. Some of the faithful have the misunderstanding that the Slavsko zhito is parastos for the Patron Saint of the Slava. The wheat for Slava and the wheat for parastos (Koljivo) are two different things. In both cases, the wheat symbolizes resurrection and eternal life (St. John 12:24). However, Slavsko zhito is prepared for the glory and honor of the Saint and for the repose of the souls of those departed members of the family who commemorated that Saint. We do not pray for the soul of the Patron Saint, but we pray that he or she intercede to the Lord our God for the forgiveness of our sins. Therefore, you should never place a candle in the Slavsko zhito. There is no reason to refrain from celebrating Slava during a mourning period in the family because at Krsna Slava we experience the unity with our departed ones. The gaiety should be omitted, but the zhito, bread, and candle never. On that day they are signs of living union between the living and the deceased of the family. To not celebrate Krsna Slava, for whatever reason-mourning, travel, poverty, instability, sicknes;s, and so on-creates a spiritual vacuum, which deprives us of spiritual gladness and our departed ones of a connection with us through the prayers on that day. For the faithful, Krsna Slava creates confidence, strength, freshness, stability, spiritual and physical peace, and the ability and incentive to do good and to lend help to others. If we want to be the meritorious heirs of our ancestors, keeping our origin, history, and symbols of Krsna Slava, we can't permit the flame of our Krsna Slava candle ever to be extinguished. Set aside 2 rounded tablespoons each of the sugar and ground walnuts and set them aside for the topping. Cook wheat in clear water over medium heat for about 2 hours. Change water several times during cooking, by draining and replacing with cold water. When wheat is cooked, drain completely and spread on a clean cloth to dry. Grind wheat in a meat grinder. Mix wheat, sugar, walnuts and flavoring. Add water until mixture is moist. Place this mixture on a serving dish. Form into a rounded shape. Combine the reserved sugar and walnuts and spread over the top. Almonds may also be used for garnish. The importance of Krsna Slava is not to have a huge, elaborate, and expensive party. All you need is the Icon of your saint, a candle, wheat, bread (kolach), and wine, the service of the priest, and an awareness that Krsna Slava is a great treasure passed on to you by your ancestors. Do not fail to keep this ancient and honorable Serbian Orthodox tradition and to pass it on to your children. As St. Paul says in his epistle to the Thessalonians (2:15), "Stand firm and hold to the traditions which you were taught". Traditional foods that are prepared on feasts are: "Slavski kolač" (славски колач) and "koljivo" (кољиво). "Slavski kolač" literally means "the Slava cake", although it is actually more similar to bread. The top of the kolač is adorned with the sign of the Cross, the "Dove of Peace", and other symbols that relate to the family. "Koljivo" (also called "Žito") is made of boiled wheat. It can be prepared in a variety of ways but most usually includes walnuts, nutmegs and/or cloves, and honey. The wheat is a symbol of the Resurrection of Christ and deceased family members. Depending on whether the celebration falls in a period of fasting, the rest of the feast consists of animal-free (posni) meals or not (mrsni); thus, colloquially, Slavas can be referred to as mrsne or posne. On the day of the Slava, the family attends church services and partakes in Holy Communion. Following the service, the parish priest is received in the family's home. He performs a small service which entails venerating the Saint's memory, blessing the slavski kolač and koljivo, as well as lighting the "slava candle". Though not necessary, it is common for the priest to bless the house and perform a small memorial service for dead relatives. The most common feast days are St. Nicholas (falling on December 19), St. George (May 6, see Đurđevdan), St. John the Baptist (January 20), Saint Demetrius (November 8) and St. Michael (November 21). Given dates are by official Gregorian calendar. Serbian Orthodox Church uses Julian calendar that is late 13 days. For example, St. Nicholas date is December 6, but by Julian calendar this date is 13 days later, when by Gregorian calendar is December 19. Many Serbian communities (villages, cities, organizations, political parties, institutions, companies, professions) also celebrate their patron saint. For example, the city of Belgrade celebrates the Ascension as its Slava. Sveti Nikola (St. Nicholas) is the patron saint for so many families that there is a Serbian saying for St. Nicholas Day, 6 or 19 December, "Half of Serbia is celebrating their Slava today, and the other half is going to a Slava." It is a very important day for Serbian Orthodox. Observance of the Slava is performed also by cultural and social organizations, cities and even military units. In addition to relatives, kumovi and friends are assembled that day, the home is open to ALL who come. Emotions of the celebrants are charged with the noblest motives. They have a readiness and desire to welcome and offer the best in friendship, food, drink , and all is ready and prepared in prayer. The host does not sit that day. His duty is to welcome and serve, "Da sluzi Krsno Ime." There are many beautiful zdravica's" (toasts) pronounced and heard on that day by the host and the guests invoking blessings of God and the Orthodox Saints and exchanging the best wishes for each other. This is a day for great spiritual rejoicing.